Here’s another quick update about the last couple days. We like to add more pictures when we have the internet access to give you guys a better idea of what we are doing. This 40 mile stretch took us another 3 days over easier terrain and culminated with a “Zero Day” in Hiawassee. Up to mile 70 we’ve been averaging about 13 miles/day (not counting the Approach Trail) and since leaving Neels Gap the trail conditions have significantly improved. Fewer rocks and softer ground means not only more distance covered with a quicker pace but also happier feet in the process! We’ve even had our biggest trail-magic yet in this stretch, and it was a good one. 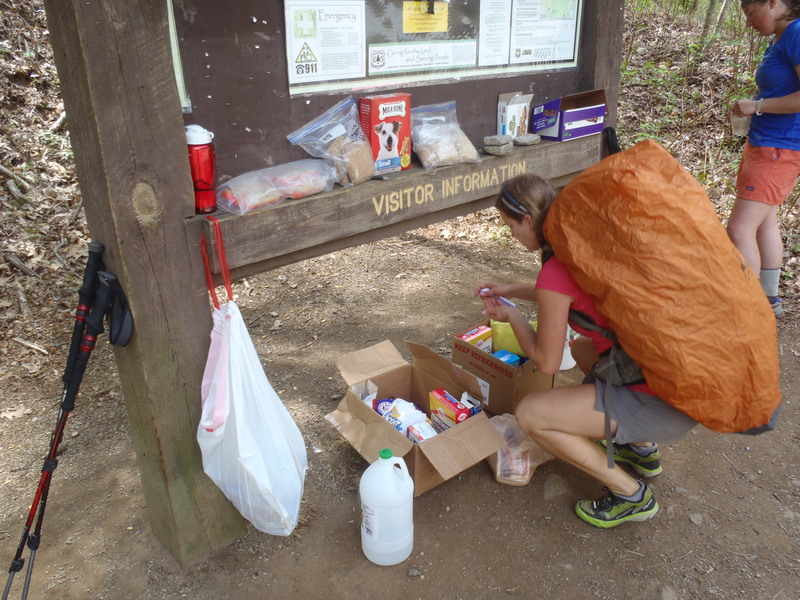 A guy, who we ended up meeting, spent a few days dropping boxes of food and supplies at all of the big trail intersections in the northern part of Georgia and we were lucky enough to hit all of his spots. When we met him on the side of the road he even had a six-pack of craft beer in his truck and when it comes to counting pounds and ounces or carrying beer up a mountain to enjoy with dinner, I’m not afraid of the pack weight! It also turned out to be our 3 year wedding anniversary on the day that we hit the trail magic and the beer so we were able to have a drink with our dinners as a bit of celebration. Lindsay diving into the mother-lode of trail magic. She didn’t even drop her pack! Our biggest problem so far definitely has to be feet. Lindsay is a trooper; I’ve seen grown men complain more about blisters that are half as bad. Each day they are getting a little bit better than before as the toughen up and we take care of them every night. The only bad part is that with each day of walking a new problem area arises! Her left foot only has two big blisters, but her right has about 5, including the baby toe that has been engulfed by a mass of blisters. My feet are alright, some wear and tear on the achilles part of my heel and small blisters but nothing that isn’t expected. We should both be good to go after our zero day, as foot fatigue is just as big of a problem as blisters for both of us! The day before we headed into town for our zero we spent the night on Tray Mountain in one of the worst storms I’ve ever experienced camping. The whole Southeastern United States was hit with some very nasty weather, including tornadoes in northern Georgia which is right where we were! To make it worse, we spent the night on the top of a mountain fully exposed to the elements save for our three-walled shelter. 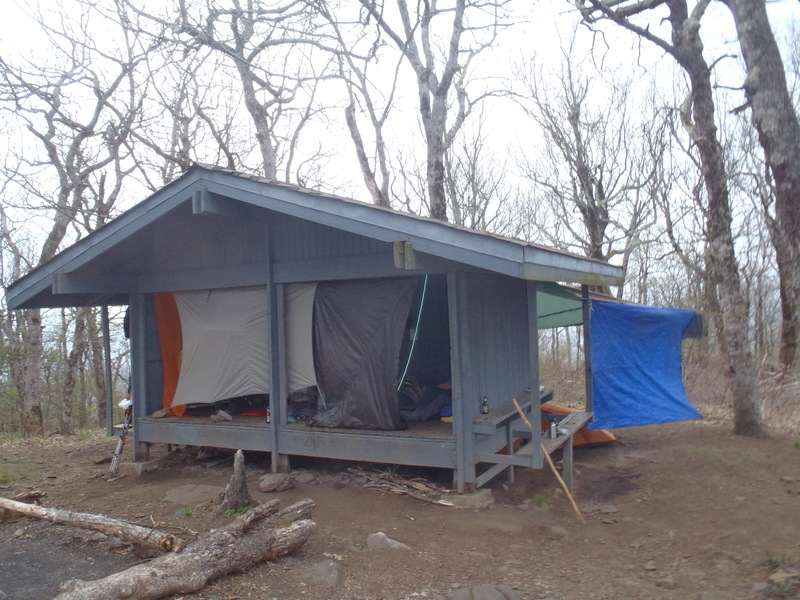 We had five hikers sleeping in the shelter and three more tenting behind it using extra tarps as windbreaks, and we all managed to weather the storm which hit at 10pm and had tree limbs crashing down and tarps ripping apart by 1am. We didn’t get much sleep that night as most of it was spent reinforcing the tent footprints we put up in the shelter opening to try to keep the wind out and rain from soaking us. We didn’t want a repeat of that so we high tailed the 10 miles into town the next morning and a building to sleep in! Again, this was the same night as our 3 year anniversary so we had one of the more adventurous anniversary nights that we ever want to have! We washed, dried and generally sprawled all over our hotel room! We made it to the trail head wihout getting wet and promptly worked on getting our hitch into town so we could get a much-needed shower and food resupply, plus a day off to let our tired feet get some recovery. Because of the terrible weather the day before, all of the cheaper options in town were booked up and we ended up staying at a Holiday Inn Express. A blessing in disguise. 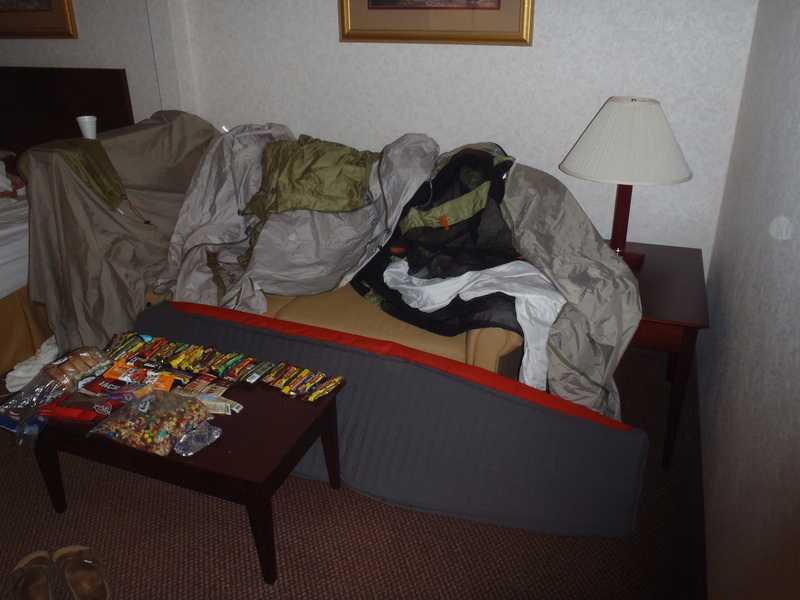 Everything that we owned was wet or dirty so we exploded into the giant room and used our private bathroom to wash all of our bags, sleeping pads, cookware and most importantly, OURSELVES! We can see why nicer hotels discourage hikers from staying there by charging more after watching how much dirt went down the sink drain! 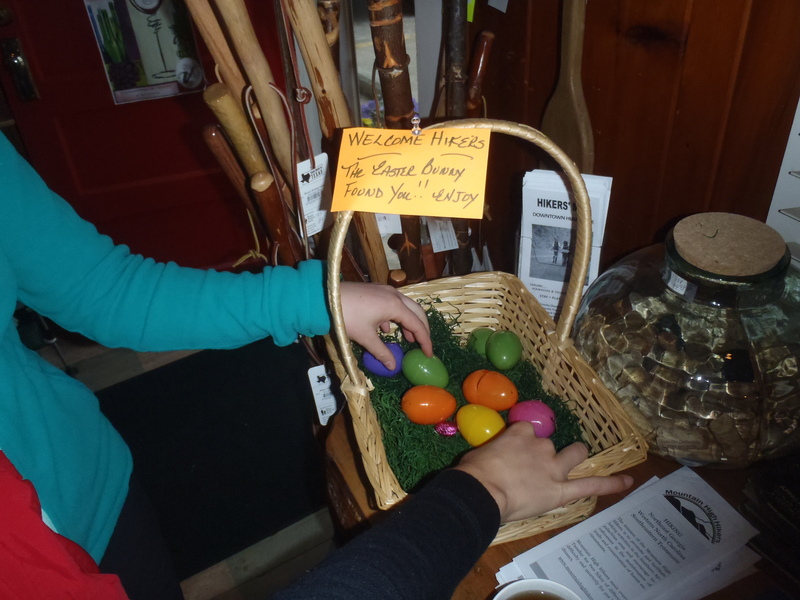 We even had a hiker Easter basket in Hiawassee! We took a full “Zero Day”, meaning we accumulated no trail mileage or progress to Katahdin while in Hiawassee to let our feet heal up and legs rest before making the big push into and through the Smokey Mountains. Most of our time in Hiawassee has been spent eating, sleeping or prepping for the next two weeks by buying food and getting gear clean and repaired. Once we leave here it will be a pretty solid push to get out of the Smokies as soon as we can to pick up our Pooch and take a few days off in Asheville with my (Clay’s) parents!